As promised, finally, the process of pairing up the Lightning Maroon with a known male PNG Maroon is finally underway. To put it bluntly, without a doubt I am convinced that for the last year, the Lightning Maroon has been male. Why? Well, first, watch this video of the female Gold Stripe Maroon that used to be paired with the White Stripe Maroon above. The new small Gold Stripe Maroon was introduced to the female Gold Stripe less than a minute before this video was taken. Watch the interactions. Next up, here’s the Labrador Maroon, trying to be paired with a “female” White Stripe Maroon. 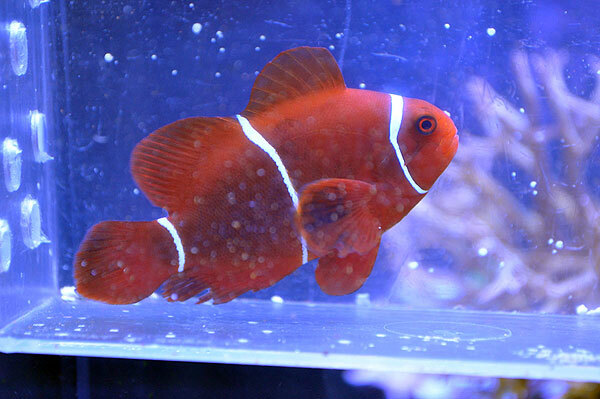 The deal here – a local hobbyist thought this maroon to be female, and was trying to pair it with a smaller maroon. The two maroons fought incessantly, and this I believe was the second attempt (the first one ended up with a dead maroon). Both Maroons wound up in my possession. I already paired the “male” with a larger White Stripe Maroon (you may recall Lucy, a lone wolf female living in a sump that Debbie in the twin cities contributed). The first go round it didn’t work so well, but after a week or two of living in a container, the male was released and all went well. So the “female” meanwhile, has been living in another container in QT and was moved in with the Labrador in a container either Wednesday or Thursday this week. Unlike the interactions you’ll see with the Lightning Maroon, the Labrador didn’t show any interest in the maroon until it was released. And the “female” maroon certainly wasn’t acting like a female…scared to death perhaps, it instantly went into classic submissive behavior. Unfortunately, in all the commotion, the Dwarf Angels started attacking too, and ultimately, after 10 minutes, the “female” Maroon was returned to her container to “lick her wounds”. And here is the same pair April 10th, 2011. 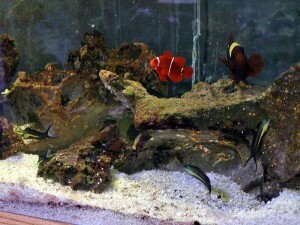 I’ve been feeding the male in the “cage” only once per day, while the other fish gets feed at least 2-3 times per day. The size difference is starting to stack up, and you’ll notice how the interactions have “changed”. Still, in the end, this pair isn’t ready…by the last video, the “female” has resorted to occasional pot shots directed at the “male”. I suspect that given more time, and a greater size difference, this should result in a stable pairing. 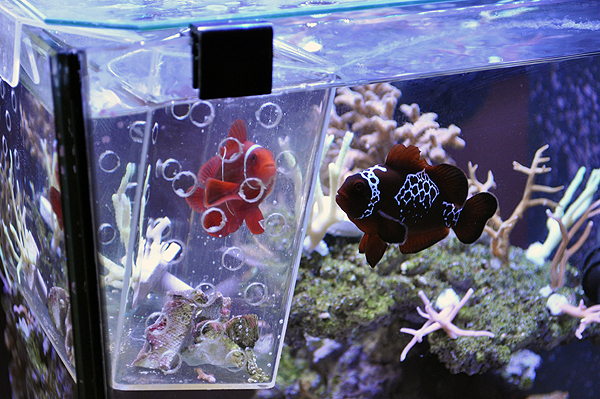 In ALL of the examples, the reactions have not been as violent as the initial reaction of the Lightning Maroon to the smaller PNG Maroon, which wasn’t even released into the tank but was held back in a drilled specimen cup. Obviously this pairing isn’t a home run. It’s a relationship that’s going to need a lot of counseling and support. As I was headed to the NWRS / UPMMAS frag swap on Friday, I reminded Renee that the small, normally colored Maroon needed to be in the cup. Sometime on Saturday, she was feeding our 11th month old son when she heard some commotion in the tank behind her. She scrambled downstairs, grabbed the first nets she could find, and returned the small PNG Maroon to the specimen cup. In the span of 3 minutes, this is what the Lightning Maroon had done. Once again, it goes without saying that everything goes wrong when you’re out of town! Thankfully Renee was quick witted and addressed the problem. Of course, Sunday evening I walked up to the tank and the little one jumped out of the cup again…the interactions I saw weren’t quite as bad perhaps. The little male PNG Maroon made all the conciliatory and submissive gestures, but the Lightning Maroon still is not a receptive mate. This is going to take a fair amount of time yet, and as most of you should realize by now, pairing up White Stripe Maroons is NOT easy. Quick note, 4-8-2011 – Pairing Process has started! No time to post more now, but I wanted to put it on record that the pairing process started today. I receive a shipment of coral from Upscales in Portland, which included 2 massive Birdsnests from Jim Blegen of Seahorse Northwest and a stunning little Gold Stripe Maroon that Travis had at his shop. Ironically it was the arrival of the Gold Stripe Maroon that kickstarted all of this today (as you may recall, the PNG Maroon I selected to be paired with the Lightning Maroon is a known male, currently spawning with a large Gold Stripe Maroon). Well, the new little GSM was destined for the large GSM, so it pushed out the PNG Maroon, who is now in a drilled specimen cup being terrorized by the Lightning Maroon. Vids, pictures, lots of stuff coming, probably by Sunday. Just a real quick update. Late last week I had a holding tank crash out on me, and in the process, one of the spare “PNG” Maroons, the only single one, was killed. I’ve been battling the cold here in this new basement setup – ich has been running rampant as heaters are either failing to keep up, or failing outright. Ambient air temps in the basement tonight are 58F, and every heater in the place is ON! Meanwhile, another semi-large Maroon was donated to the project by “Damsel Debbie” from down in the Twin Cities area. 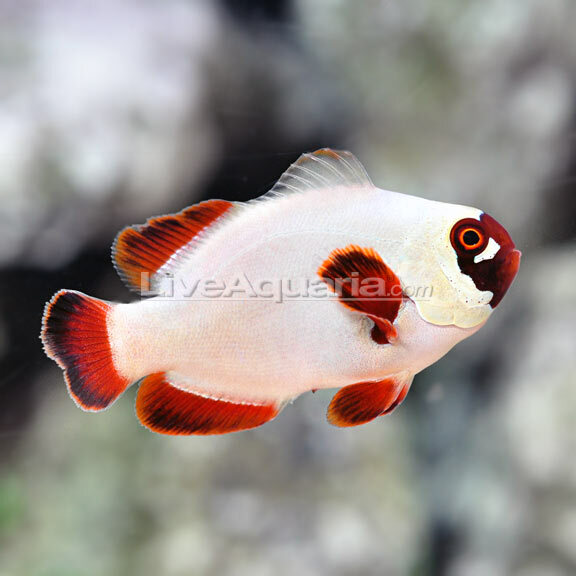 Lucy is a White Stripe Maroon, maybe 3.5″ long…definitely a fish that will go female if it’s not already. The thought here *might* be to pair Lucy up with the PNG Maroon that’s currently paired with the Jonica’s Gold Stripe….that frees up the Gold Stripe to be mated with a male Gold Stripe (preferable in my book) and will keep the PNG male a male. I’m heading down the path of trying to pair up the other two PNG Maroons. One is given free reign of the 10 gallon reef and is fed 3 times per day. “Her” potential mate is only fed once per day and is housed in a breeder basket…. 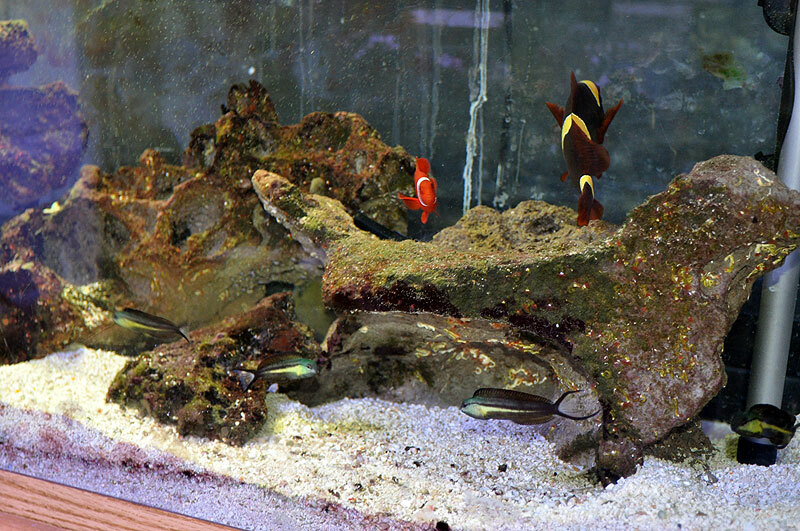 (these are the Maroons that I showed being introduced a couple months back, where the one in the tank instantly attacked the other one upon introduction). The theory here is that even if I could never find another WC PNG Maroon, I could “create” a female through the pairing. I could also allow the Lightning to go female, pairing it with the small male, which is a safe route to go and keeps the PNG bloodlines clean. It only sacrifices the Lightning being a male, which as I’ve mentioned some people are in full support of making the Lightning the female in the pair. And so the project goes…slow as always. No news..is it good news? Yeah…this is one of those times where no news is relatively good news. 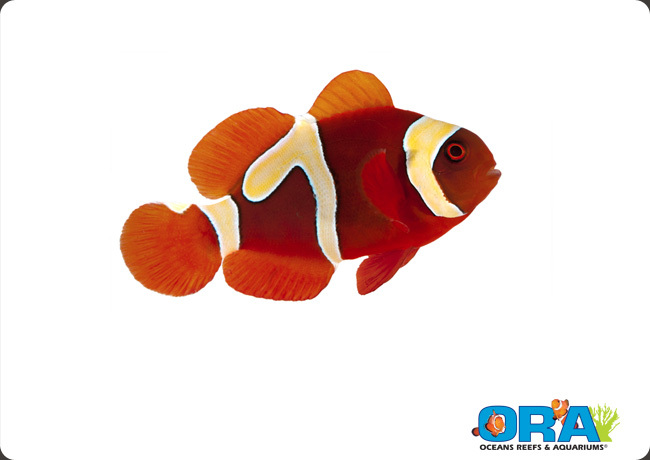 I’m in need of some Lightning Maroon Clownfish updates! Where to begin? How about the new pair of Maroon Clowns I got from Greg a while back. He had them spawning, but they’ve yet to spawn since arriving…I picked them up from Greg on September 19th, 2010 if memory serves right. I’ve been watching this pair for a while. The female is a white stripe, “The female was purchased at Fish and Pets (defunct ) in Rochester, MN.” according to Greg. 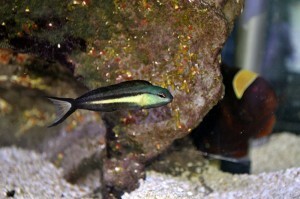 The male appears, on some levels, to look like it might be a Gold Stripe, or perhaps maybe a cross with a Gold Stripe. 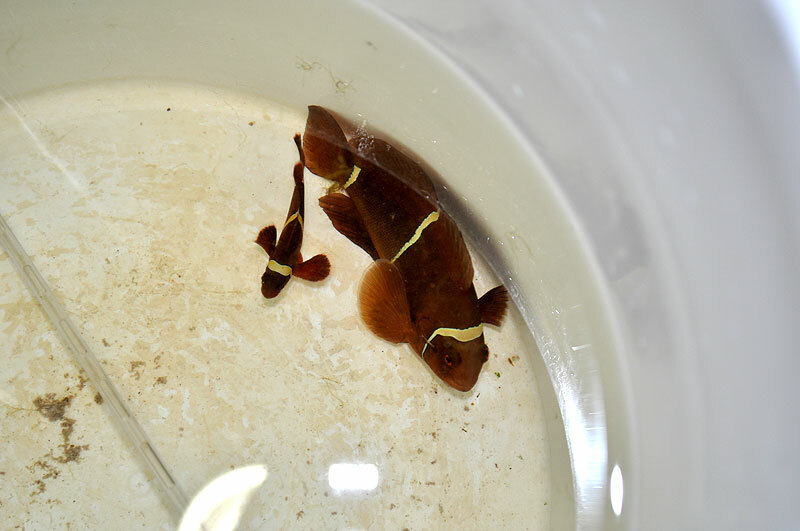 I’ve done some preliminary work with Greg to nail down where the male came from, and so far the best answer we’ve come up with is a breeder who was selling maroon clowns at a frag swap in Madison, WI, maybe 1.5 years ago. Working on getting a better answer…I’d like to find out more about the male’s lineage, just for my own reasoning. The Gold Stripe female that I picked up a few months ago continues to live happily with her PNG male. At this point, were I to opt to push the Lightning Maroon to become a female, the white stripe male with the Gold Stripe female would be the choice. Still, if I really take my time, I could force one of these other PNG juveniles to become a full blown female, at which point I could use it with the Lighting Maroon (again, assuming the Lightning remains male through all of this). Meanwhile, this pair *might* be spawning…the male sometimes disappears for days on end, which is suggestive of nest tending, although I haven’t found any nests nor have I observed the female Gold Stripe Maroon to get “ripe” and then look “spawned out”. 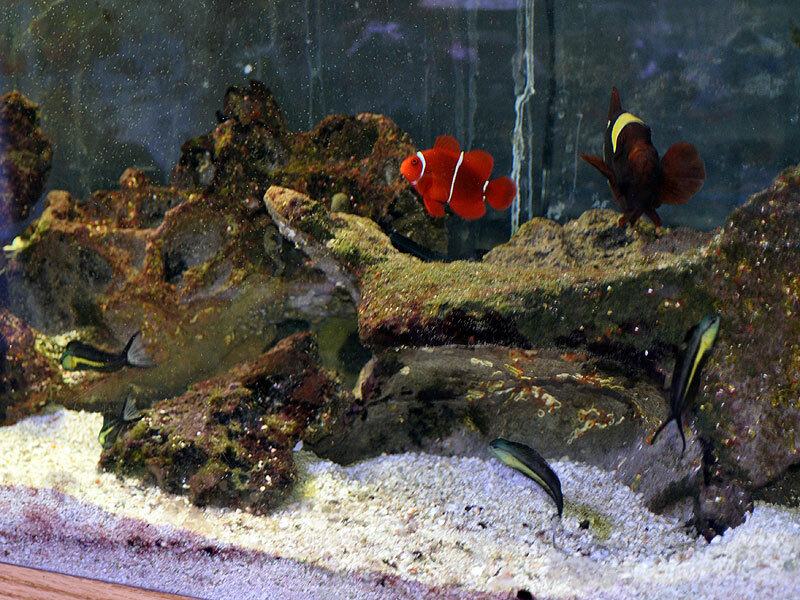 So officially, despite having 9 different Maroon Clownfish in the basement, I don’t have ANY spawnings occuring in any of the pairings. I’ve put in a special request with David and Mark @ SEASMART. I asked them specifically to try to find me another large female from Fisherman’s Island and to have it shipped direct if possible…keeping it in the chain of custody as little as possible. Along with that, they’ve had some nice small males show up with abberant markings. Foregoing any outside chance of finding yet another Lightning Maroon, a male with these markings might be indicative of possibly a genetic predisposition, or even going so far as to suggest that perhaps these are ultra-low-grade examples of a wide continuum of Lightning Maroon mutation. Of course, this all remains on the horizon. I have also been patiently awaiting the arrival of a new home for the Lightning Maroon and its future mate. I’ve been keeping this very hush hush, primarily because I don’t want to jynx it! Of course, a couple weeks back, the tank was finally on its way only to be crushed by the freight carrier. Back to waiting. What I will say is that the ultimate home of the Lightning Maroon will be the nicest and most modern tank I own when it’s all said and done. I hope furthermore to deck it out to showcase exclusively the marinelife of PNG as presented by the SEASMART program. I have also decided to go back to the drawing board and be schooled in SPS husbandry by my friends Jay and Frank, who clearly do worlds better with their SPS than I ever have. Of course, SEASMART isn’t even planning on releasing corals from the mariculture program for at least another couple weeks (last we all heard, December 2010), so there is still time to plan for all this. And that sums it up for the moment. We all knew this was going to be a very long, drawn out project, so it should come as no surprise that things have been quiet for a while. Even I must admit, the waiting is starting to get to me…I really want SOMETHING to happen. 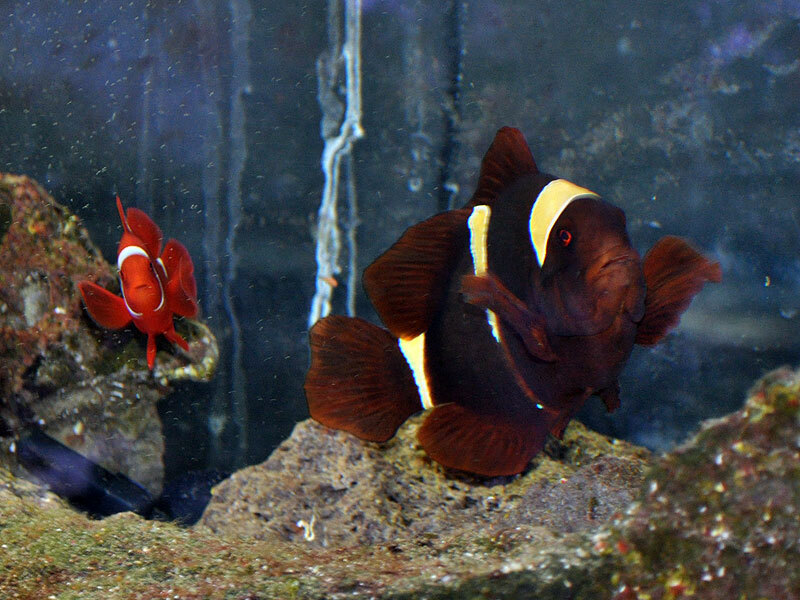 Then again, I look at the pair of Fire Clowns, Amphiprion ephippium, that have been “working on it” for over a year now and have not yet spawned either. Clownfish just take time. 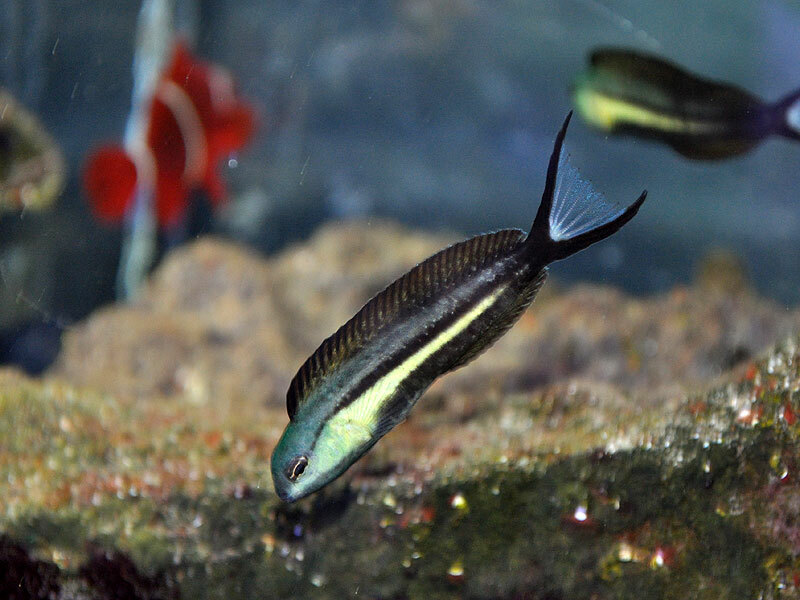 Pair of Black Ocellaris took 4 years. So, nothing here is gonna be rushed. If I don’t post again before the end of November, a happy Thanksgiving Holiday to all the US readers!